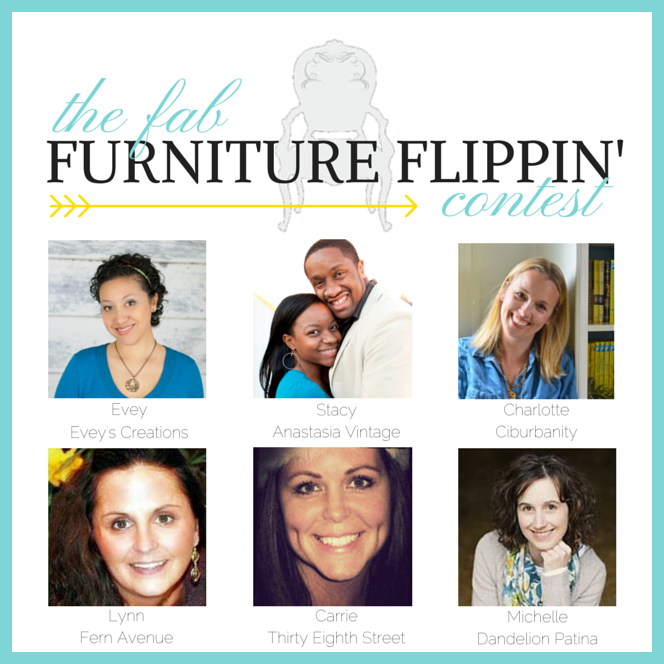 I am so excited I get to participate in the The Fab Furniture Flippin’ Contest again, this month the theme is Come On, Let Your Colors Burst! It was great to get out of my comfort zone of creams and grays and spice things up a bit! I scored this cute piece at an estate sale a few weeks ago. Do you ever walk into somewhere, see something and know you have to have it? That was this piece, it had so much charm and character, the only problem was the family wanted way more than I could afford for it. 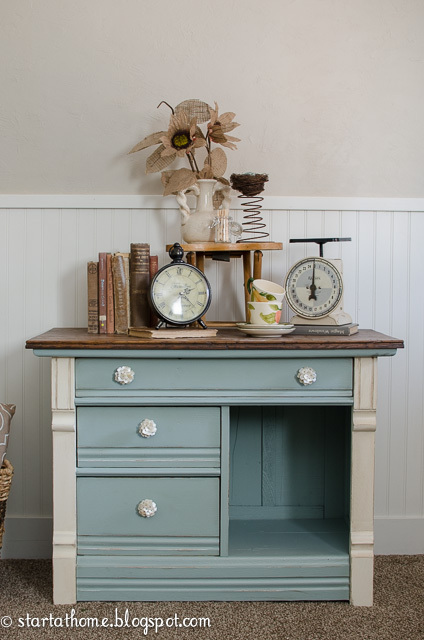 When I am looking for a piece not only do I look for character but the price is a huge factor for me. I try to keep my prices low, so in turn I have to find good deals in order to turn something for a profit. When the family wouldn't budge on their price I had to walk away from this piece, which was no easy task. But lucky for me my Mom went back a few hours later and they had marked it down to my original offer, we were meant to be together! I love the soft serene feeling this chest now has. 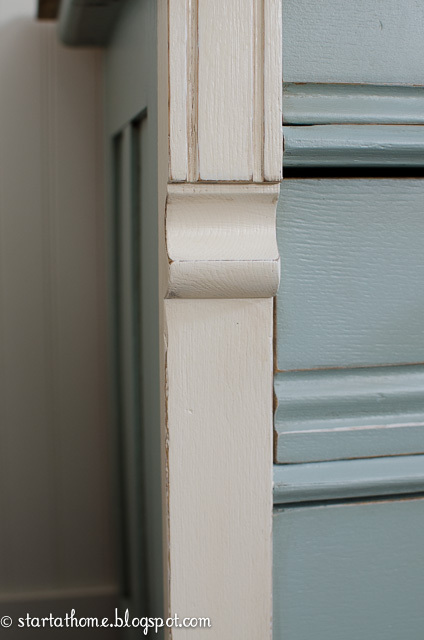 I painted the outside columns cream so they would really stand out and show off the beautiful details of this piece. 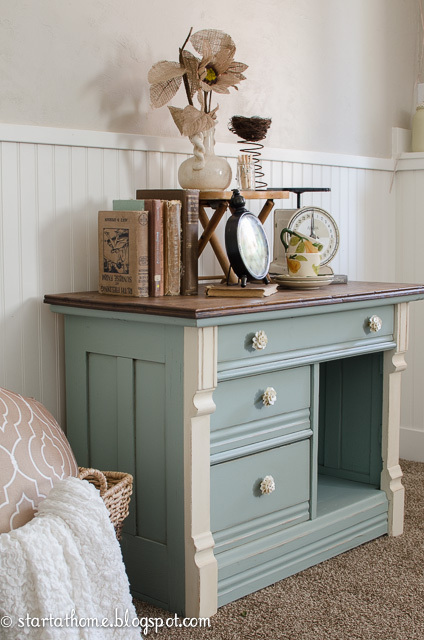 This paint color was an oops, I took another piece into have it matched and instead of matching it...this is the color we got, which I LOVE so I kept it. I first sprayed this piece to achieve a nice smooth finish. After it was dried I roughed up the edges lightly. I like to sand the edges as it helps to prevent paint chipping. After the edges were sanded I applied an oil based glaze to really bring out the details. 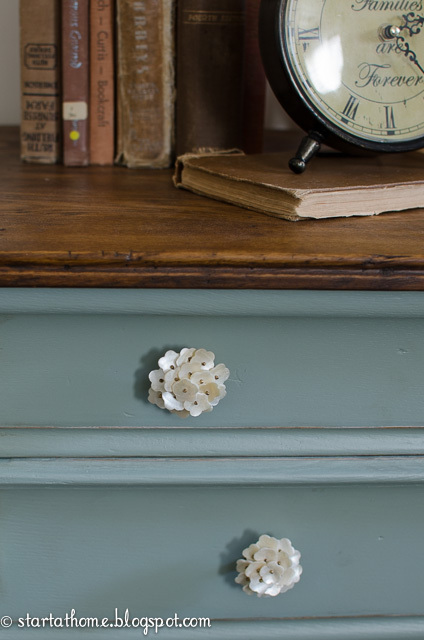 I just love the charm of this piece! The top of this piece is worn, it has dings and scrapes. 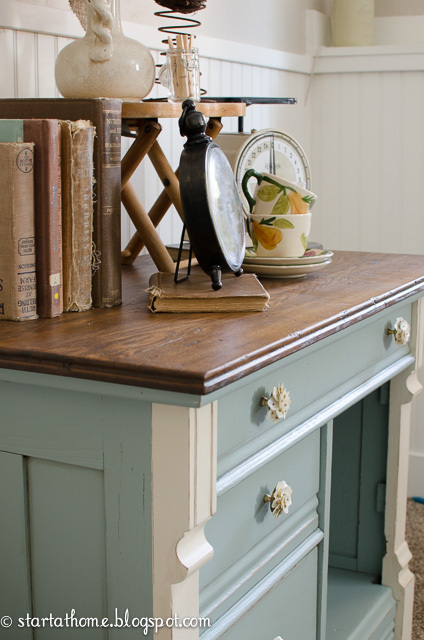 Usually I would sand them out but this time I left them there, it shows this pieces age and adds charm. For the top I used General Finishes Java Gel Stain. These beautiful knobs I found at the World Market. 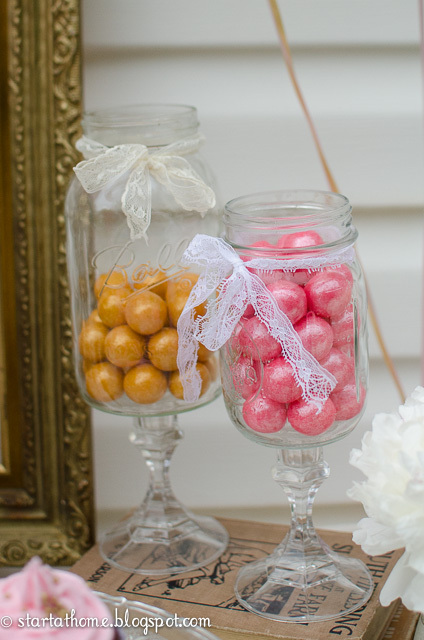 Aren't they just perfect for this piece! This months sponsor for the Fab Furniture Flippin' Contest is Unicorn Spit. They have a beautiful, vibrant line of colored gel stains and they make the coolest designs you need to check it out. Want to make your own monster cupcakes? 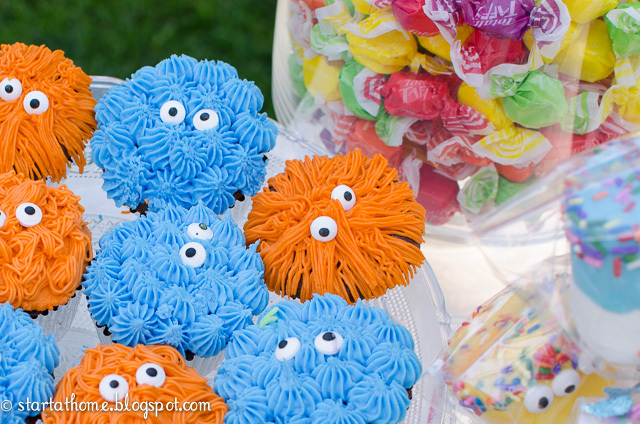 These monster cupcakes are so fun to make and they are pretty easy too! First you will need to make your cupcakes, I like to use Betty Crocker’s butter recipe. They stay more moist in the middle. 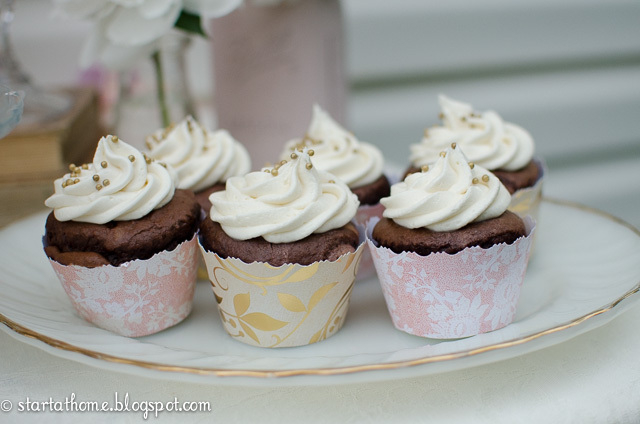 To get the perfect sized cupcake I spoon in about 3 tablespoons per cupcake cup. My favorite cups to use are the tin foil ones, they look much nicer after they are cooked. 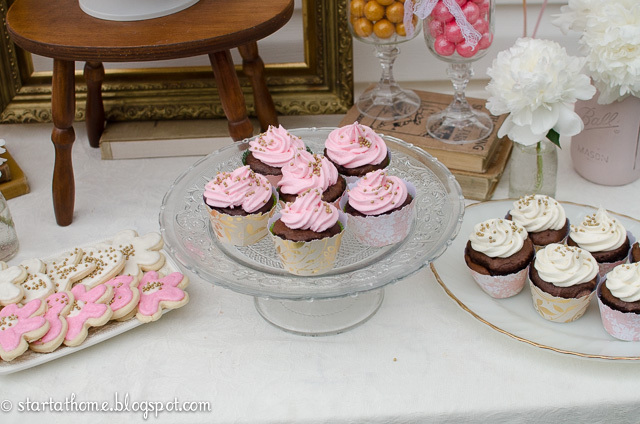 Once you have your cupcakes you will need frosting. 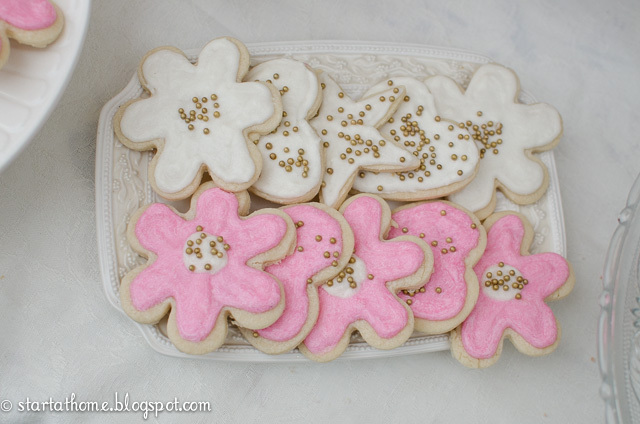 I made a buttercream frosting for mine, but you can use the stuff you buy from the store too. I like the whipped best, it isn’t quite as heavy. Once you have your frosting you will want to dye it. I use the gel dye’s, you can buy them at most grocery stores. To get deep colors you will need LOTS of coloring, but be careful not to add too much or it will make your frosting taste yucky. The Bob Vila Thumbs Up Competition is coming to a close. If you haven't noticed already I am slightly competitive. The lady I am competing against is defiantly giving me a run for my money. I am so happy I am actually competing as she has 43k followers on Facebook......HOLY COW, that is like my dream amount of followers. I owe all of you a huge thanks, I couldn't still be in the running without you. I have been so grateful for all the support I have received already, both of my Grandma's are even voting everyday! Yeah, they are pretty hip! I need your help for one final push to win this thing! 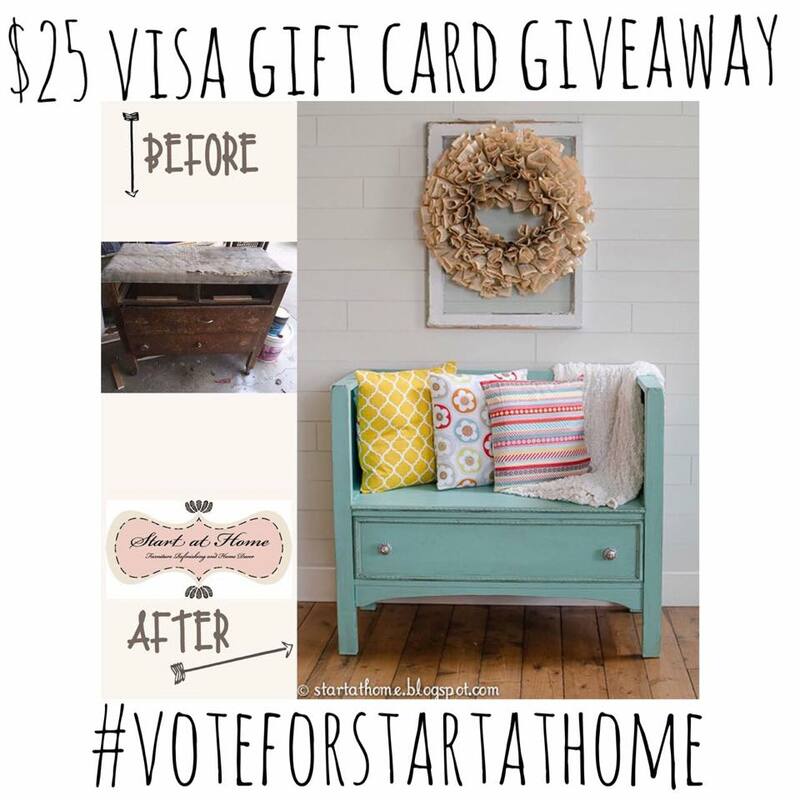 I am giving away a $25 Visa gift card to one lucky voter. 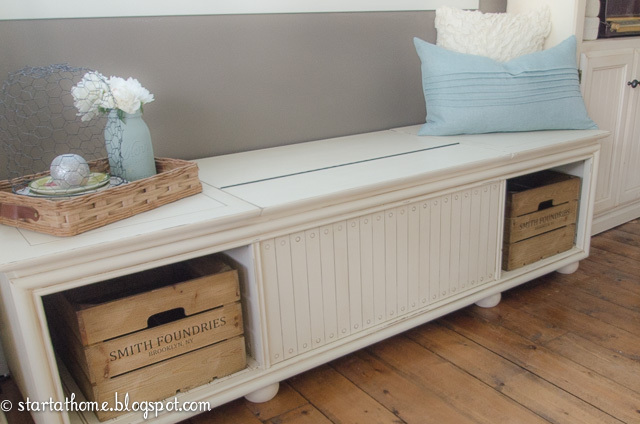 All you have to do to enter is vote for my dresser turned bench (here) Follow me on either Facebook or Instagram and leave me a comment so I can enter your name in the drawing. The contest is coming to a close Tuesday June 30th at 11:59 pm. You can vote once a day per IP address until then. I can't believe our little man is 1! It feels like just yesterday I was laying in bed feeling like a beached whale wondering if I was ever going to have this little boy. The 9 months of sickness was worth it, our little guy is so sweet and fun. It defiantly is a change of pace to have a little boy, but he is breaking me in fast. I had no idea all the garbage in the garbage can belonged in the toilet, or that lazy susans were made for little boys to hide in. My daughters have nicknamed him the monster baby, nothing is safe when he is awake! 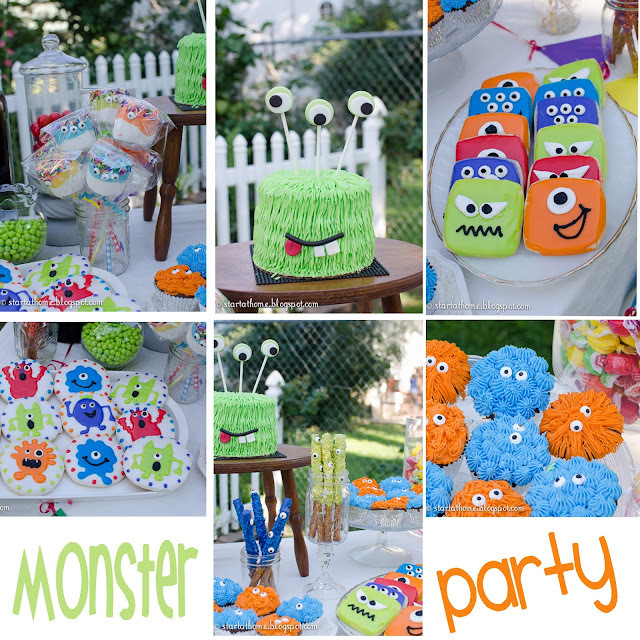 I felt it fitting to have a monster party for our little monster. I bought these chairs years ago at the DI (a local thrift store) for $5 a piece. The caning on the back of the far one was destroyed but I decided to take a chance on them. After all if worse came to worse I was only out $10. I looked up how to fix caning, I quickly learned I wouldn't be fixing it. I would have to come up with some other idea to cover up the caning. I decided to upholster over the top of it! 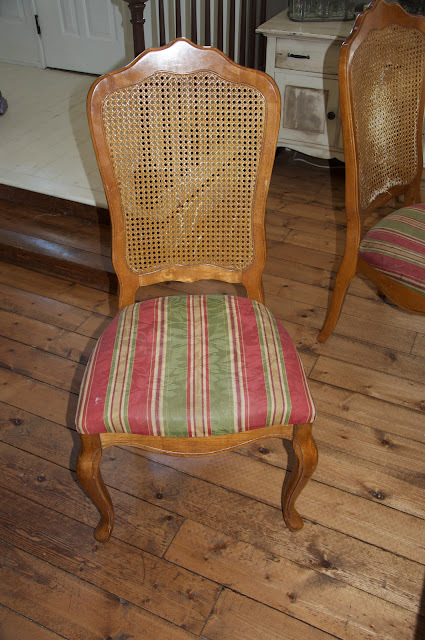 I left the caning on the chairs for added support and I added batting to the front and back. 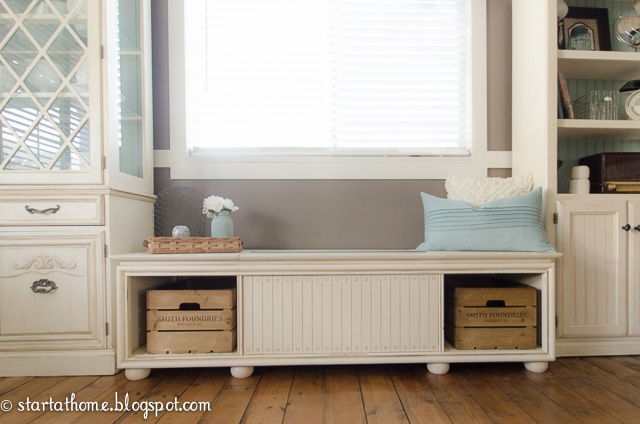 I used a $10 drop cloth I bought at Ace Hardware for the fabric. I have loved working with drop cloths. They are very durable and a great cost saving option. 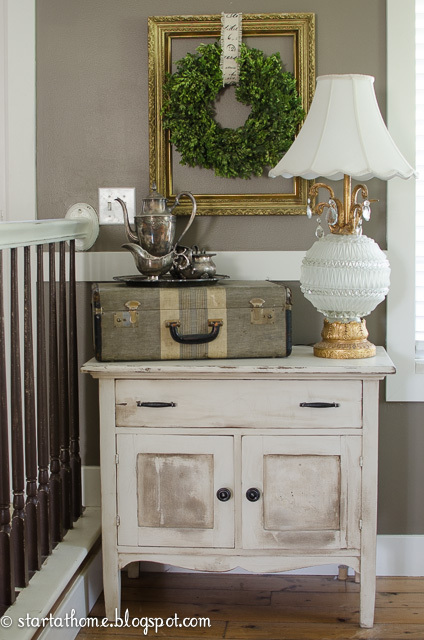 Here is this beautiful cedar chest a client brought me a few weeks ago. Originally they tried to strip and sand it down to the wood, but they sanded through the veneer...oops. I hate it when that happens. ...but it is nothing a little bit of paint can't fix! I don't paint everything I get my hands on. There are some pieces I believe should be left alone. 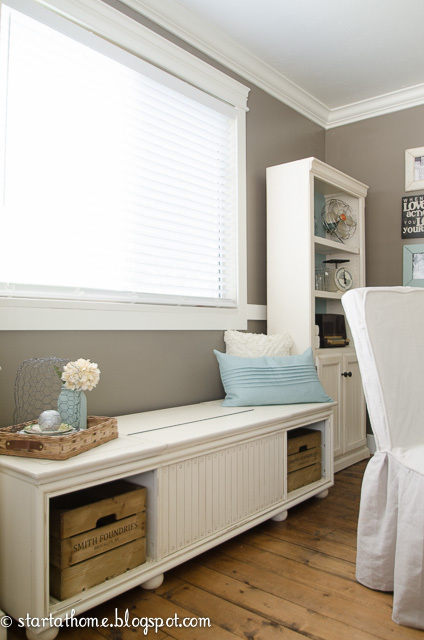 But in this situation paint was an excellent solution and it made the moldings stand out so beautifully! 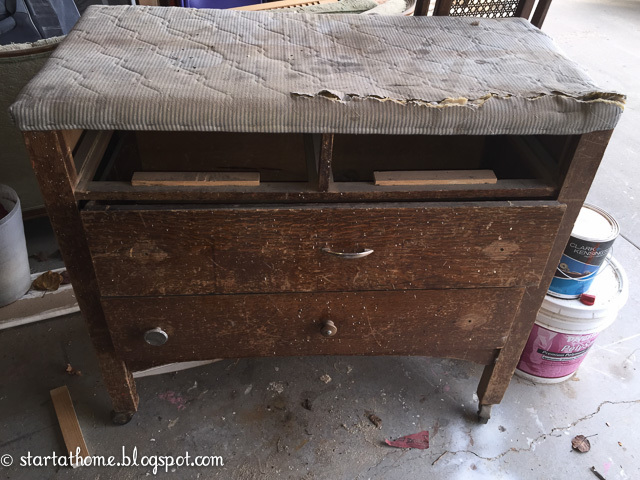 The top of this sofa table was missing it's glass when I picked it up (before here). I wasn't too heart broken, I am not a huge fan of glass tops anyway. I had to come up with a new idea for the top of this table. 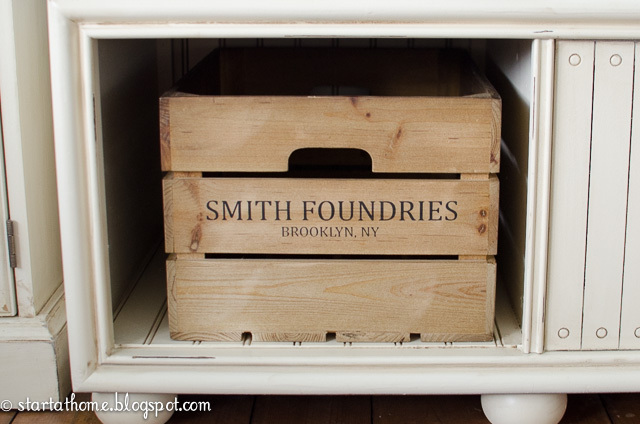 Originally I was going to go and buy some pine planks and use that until my brother-in-law dropped off a perfect pallet! What is better than a free top with amazing texture?! And it was super easy to make! 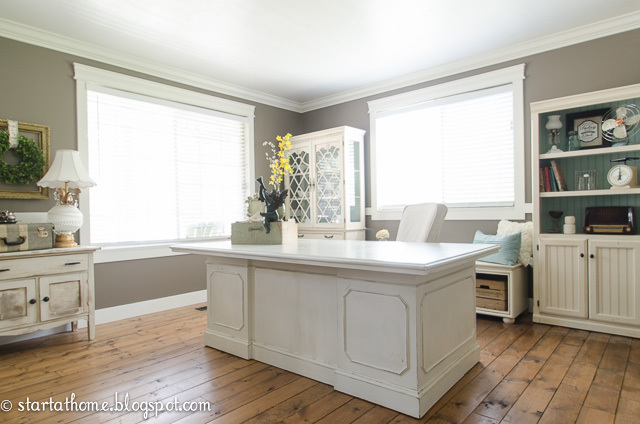 My living room turned office is one of my favorite rooms. 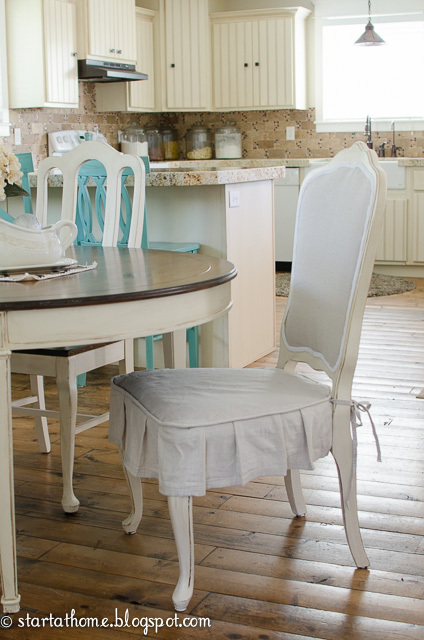 It is one of the only rooms that I can say is almost done, with exception of the kitchen! I just need to finish upholstering the chairs that will go in front of the desk. Although, my husband says with me nothing is ever done. I suppose he is right, things seem to always be evolving around here. 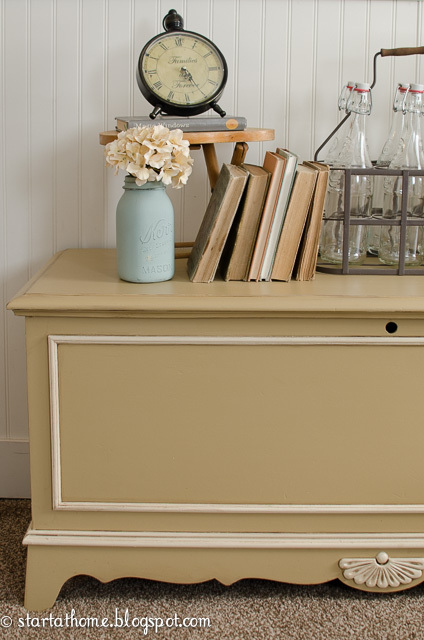 I have been looking for a credenza for quite sometime now to go behind my desk. 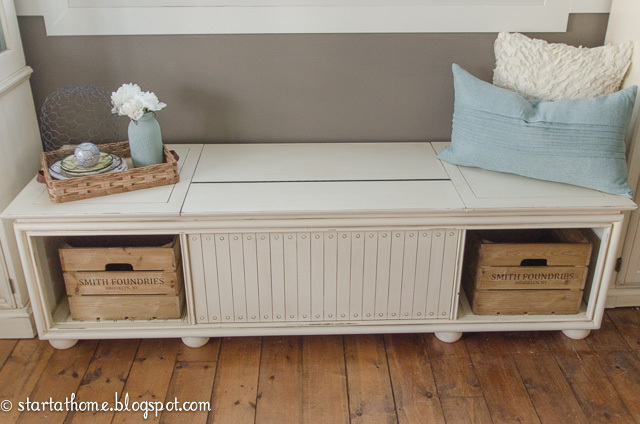 I was planning to sell this record player turned bench (post here) until my husband had a brilliant idea to use it as a credenza, and it fit perfectly. I love having this bench here, often times there are many people crowded around the computer, now they have a place to sit! I have made a goal for myself this week to blog everyday except Sunday. I have had this goal in the back of my head for quite sometime now but every week something seems to come up or I am feeling burnt out by the end of the week so I go to bed early instead of blogging. This week I have planned out my posts, so lets hope all goes as planned, I know it sounds strange but this will be a huge milestone for me. With 3 kids under 6 some days are consumed with being a mommy. At times I get frustrated I didn't check as many things off my to do list as I had hoped, but I keep reminding myself, if I loose sight of what is really important, my family, when it is all said and done I will be terribly sad. And here she is after! First things first, you need to make sure you preserve your boxwood branches correctly, it takes at least 3 weeks. 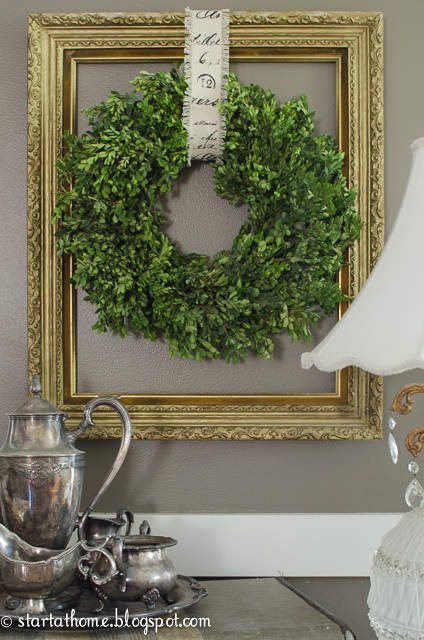 I have been eyeing boxwood wreaths for quite sometime, I love how they stay green all year round. If you have looked into buying one, as I have, you know they don't come cheap. Unfortunately for me the price tag has never fit the budget...until now! My mom was giving her boxwood bushes a hair cut so I decided to take the branches home with me and see if I could figure out how to make a wreath out of them. 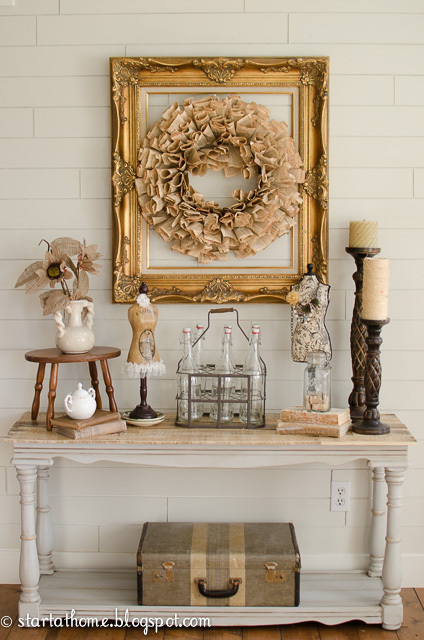 And now I have my own boxwood wreath for under $10! I do have a bit of a competitive side so I jumped at the chance to be part of this months Fab Furniture Flippin' Contest. 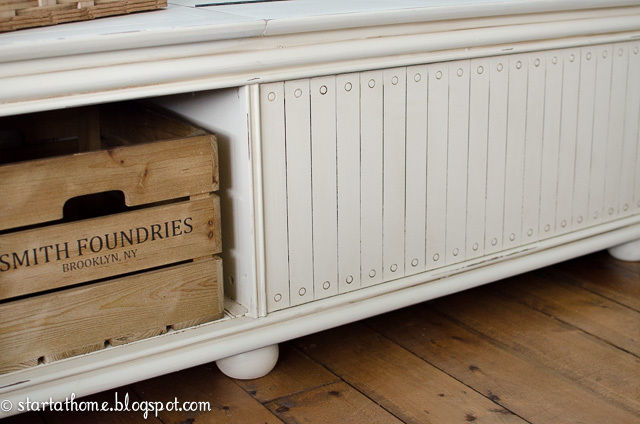 When I heard that this months theme was Shabby Chic Storage I had just the project in mind. Plus, it gave me a little motivation to get this record player out of my garage, which had been in there for at least a year! Here it is before, retro right? If you have ever torn apart an old record player you know how long it takes. These things were built so well it is a very long process to hallow them out, we are talking hours and hours, but it was worth it! I wanted to make this record player into a bench to sit behind our computer, so I took off the old retro legs and added new bunt feet, making it the perfect height for a bench and adding a more shabby chic feel. 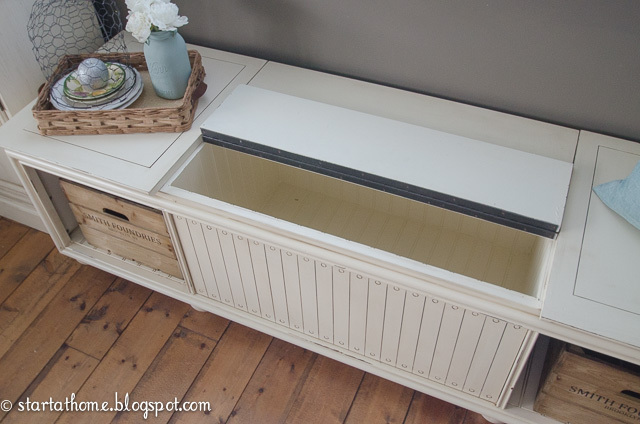 I pulled the record player out and lined the box with bead board for some awesome added storage for our office. I think I will hide our printer in there! 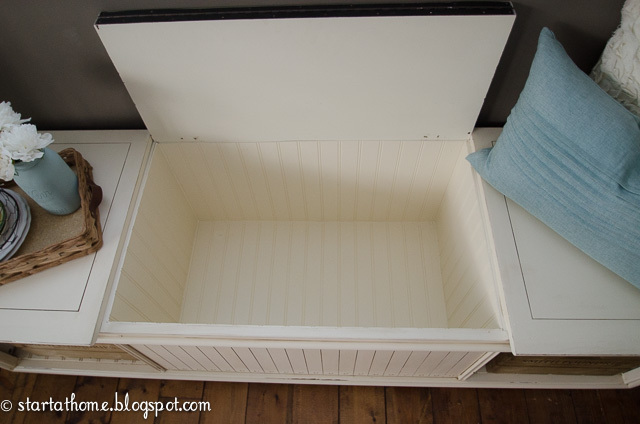 The cubbies that used to house the speakers have also been lined with bead board and found these cute crates at Home Goods to slide right in. Perfect fit!! Since this piece is going in my office I wanted it to match the other pieces I had already redone. 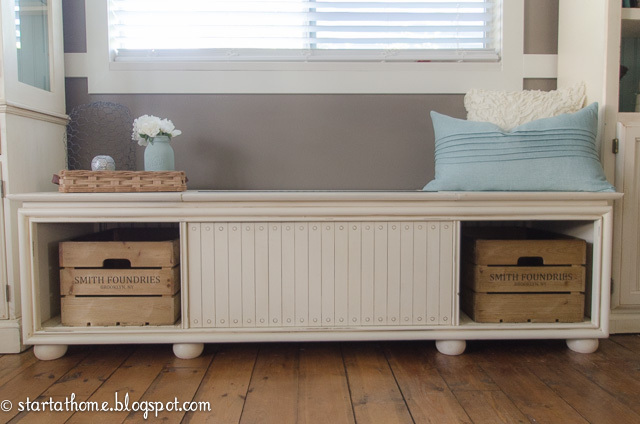 I sprayed this bench with a custom mixed latex paint (I know I always say that) and then antiqued it with sand paper and glaze to bring out all the details. I also top coated with with a spar urethane to help it hold up better against my kids. As I imagine they will be climbing on it too! 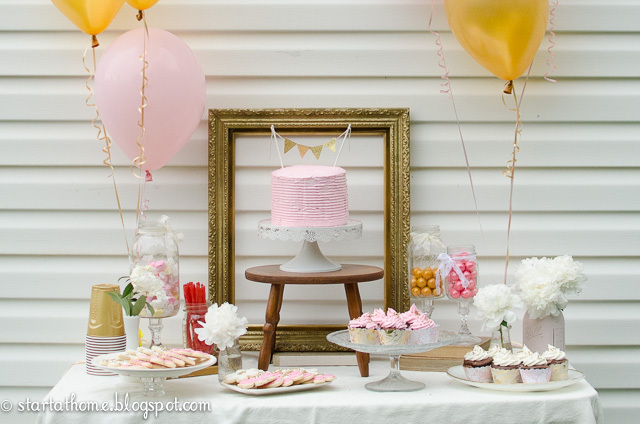 My daughter had a birthday this week which means I spent most of my week in the kitchen. I wasn't going to go all out this year but as her birthday got closer I just couldn't resist. I don't bake sweets very often, probably because I eat way too much of it. But it was nice to spend some time in the kitchen rather than the garage. 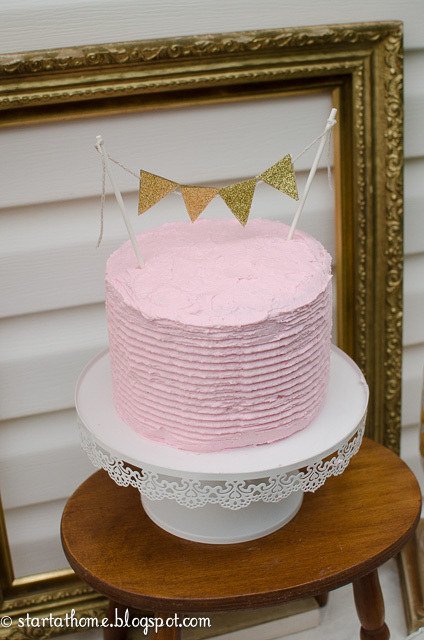 I have always loved the look of textured cakes so I bought some cake combs and a turn table from Joann's this year to experiment with, it isn't as smooth as I would have liked it but I love the texture! It will take a bit more practice that is for sure!! My daughter and I made these cookies together the day before her birthday. She is such a good little helper and I love that we get to spend some one on one time together! Plus, the cookies were delicious and the first things gone! 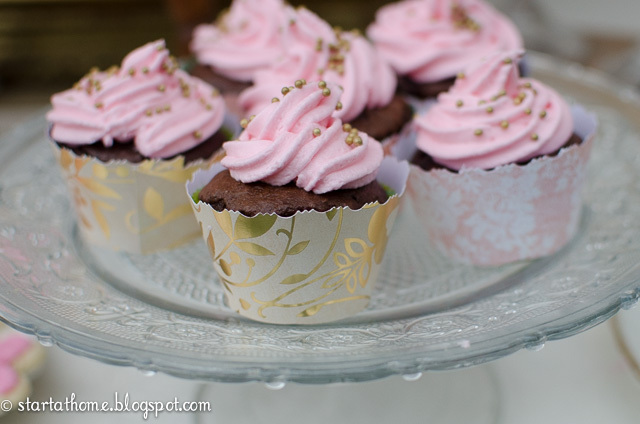 For the cupcake wrappers I used a generic cupcake pattern I found on Pinterest and cut them out of scrapbook paper. 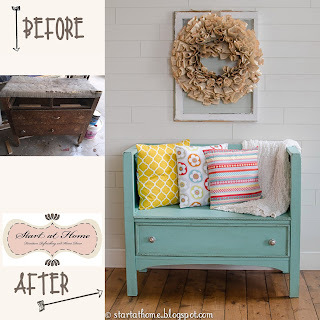 To get the fun edge I used scalloped scissors. 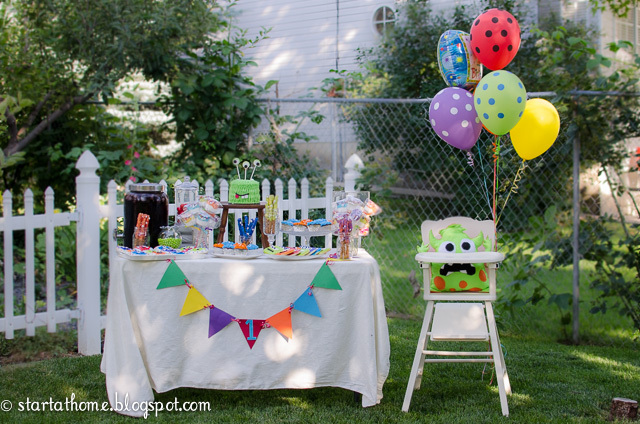 The party turned out great. It was a nice evening spent with friends and family! 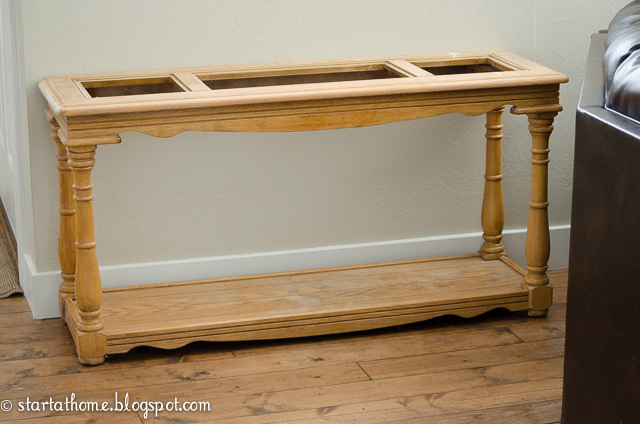 You may have heard.......I have the privilege of being part of Bob Vila's Thumbs Up Competition for my dresser turned bench. I would love to have your vote! 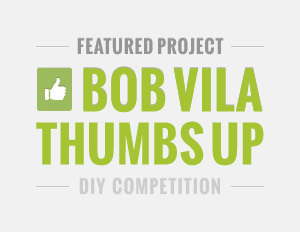 About a week ago I received an email saying I was invited to Bob Vila's Thumbs Up Competition. I read the subject and then proceeded to read the email. Once I finished it I handed my phone to my husband and said, "this is too good to be true, do you think it is a scam?" He read through the email and reassured me it was the real deal. I just couldn't believe it, this is the kind of stuff I dream of!! 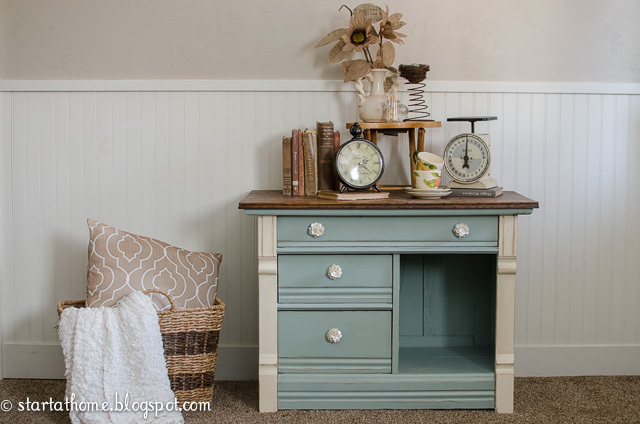 The topic for the competition is Repurposed Dressers, and I have to admit I have some pretty stiff competition so I need your help! 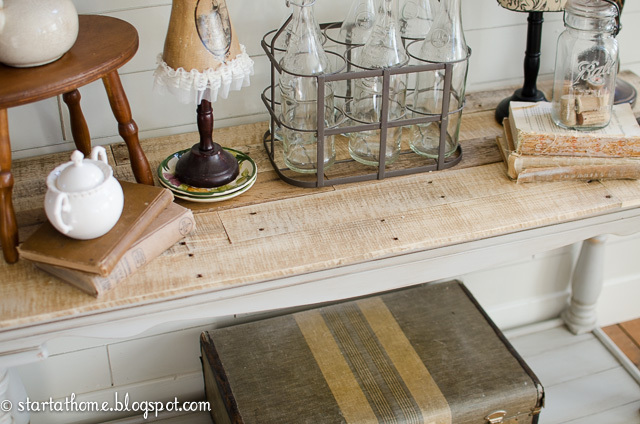 You can vote HERE for my dresser turned bench! And here she is after! 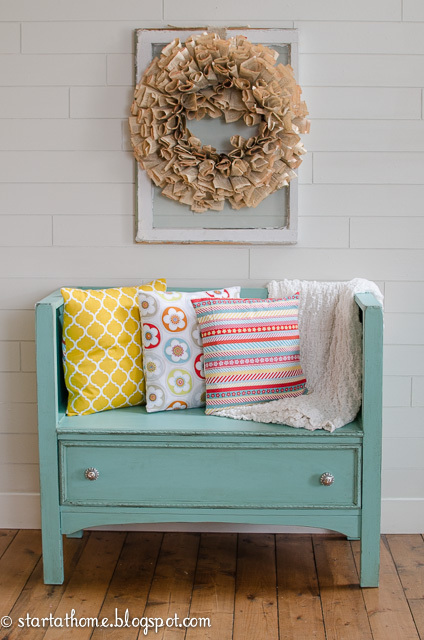 I just love this bench and feel so grateful and honored to be featured! 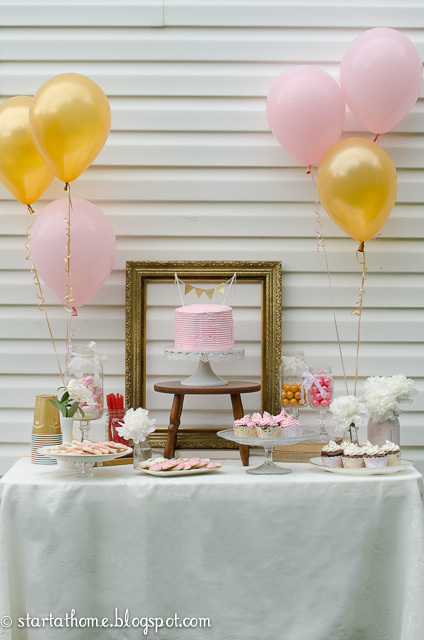 Gold and Pink Cookies for the Birthday Girl!